Cirrus Ventilation by Best - Very Cool! 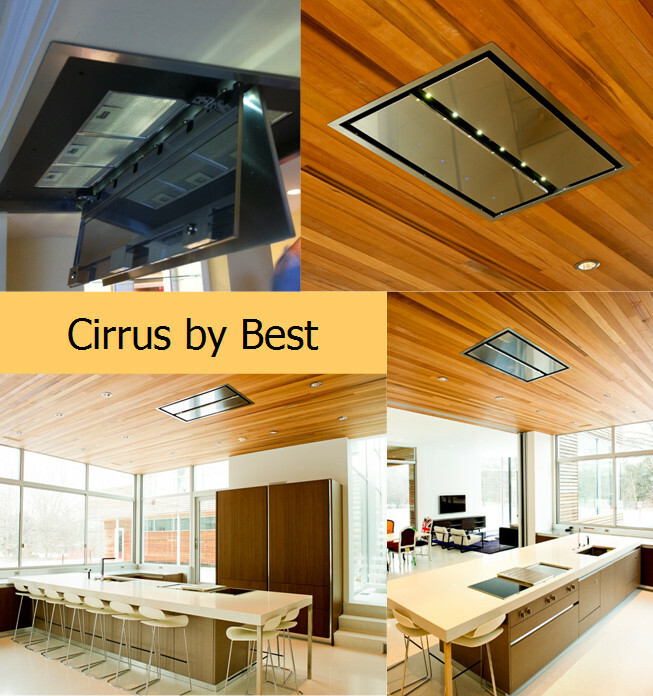 We are big fans of Best’s new Cirrus hood design and can’t wait to design it into our next project! This hood, however, isn’t for everyone at first glance. There are A LOT of questions about installation and actual effectiveness as well. The Cirrus hood can go over ANY cooking. In fact, it will likely be more effective over pro gas cooking. The reason for that is that the air is heated much quicker and with higher heat. This makes the air rise faster (which means it will get to the ceiling and the hood quicker before escaping to other areas). Don’t be afraid of this hood over pro cooking! You now know why! We all know that the Cirrus hood is not “ideal” ventilation, but instead it’s a great solution. We all know that putting a hood that is 30 – 36” over the cooking is ideal, but the fact is (especially in an island) that a lot of people won’t or can’t do that. This then leaves them with a downdraft only. Not only do we know that a downdraft is not very effective, but what if they have a range in the island or even a range top? You can’t even use a downdraft in those cases… hello Cirrus! Cirrus is also more effective than a downdraft because all the smoke and heat are going to the ceiling (it isn’t going backwards and down…. Even with the help of suction). You also have the benefit of LED lighting with the Cirrus, which you can’t get from a downdraft. If a designer/consumer selects a flat bottom island hood, or even one with only slight capture area, again the Cirrus hood would be more effective. With heavy cooking, the smoke comes off very fast and will often roll of the edges of the hood and go to the ceiling. Once it gets past the hood, there is no ventilation left at all. With the Cirrus hood at the ceiling, it will now capture anything going up to it or around the unit. It uses the perimeter aspiration, which accelerates the air speed at the opening and pulls air from the perimeter. As you know, you can use inline or exterior blowers with the unit and get up to 1500 CFM. If you are still unsure about the effectiveness… why not use multiple units? Best has already had one kitchen dealer in TX install 4 of them. Last but not least… How do you clean this unit? Check out the photo where the vent is open… This shows the filters inside. All you have to do is pull the panels down from the outside edge (they are hinged in the middle), take out the filters, dishwasher safe, then replace and snap the panels back up and your done. Isn't this great!?! Contact us for more info if you are interested in learning more!